Many people are labouring under the notion that they are not smart enough and may never accomplish anything worthwhile. They look at those they consider successful and ape their skills and pursuits. But they keep getting frustrated because they never seem to match these standards and expectations they’ve set for themselves. Sometimes, the individuals concerned did not start this vicious cycle by themselves. They were pushed into it by their parents or some others close to them. We hear of parents who threaten to cut off their children’s tuition if they don’t study certain professional courses like medicine and law. And when the kids obey and perform poorly, they are adjudged stupid. Albert Einstein, the German-born scientist and Nobel Prize winner, whose theory of relativity helped to lay the foundations for modern physics and quantum mechanics, was not considered smart as a child. In fact, he was seen as a poor student, perhaps a retarded one, by some of his teachers. How did they rate him? I would imagine that because recitation is a vital part of early education and Albert couldn’t speak well even at age nine, they thought he was probably mentally handicapped. But they failed to take into account his mechanical skills and deep curiosity about the forces that direct things in the natural world. For instance, at six, little Albert could play the violin. His academic challenges continued because he wasn’t an all-rounder. He excelled in mathematics, unveiling geometry at twelve and became adept at calculus by sixteen but his performance in other subjects remained poor. Moreover, he hated school at that level. He was probably raring to go to university where he would have the liberty to investigate the scientific things that intrigued him. Just when he wanted to ditch school at sixteen, the teachers “did him the honour” by booting him out because his negative attitude was influencing other students. It is hard to imagine that Einstein, whose name has become a synonym for genius, failed exams as a student. But that is what happened. He couldn’t go to university straight because he flunked the entrance exam. He had to do a diploma first. Now, doesn’t that sound familiar? Einstein was at home with Physics and Mathematics and when he devoted his full attention to them, he made discovery upon discovery that helped transform the world. So, what are you good at? It doesn’t have to be something everyone is celebrating or recognises its importance. But if it’s what God has placed inside you, harness it, refine it and use it to benefit humanity. When Mother Theresa answered the call to live among the poor in Calcutta, she had no idea that that path of destitution and compassionate care for the infirm and paupers will result in her becoming a global celebrity, a Nobel Peace Prize winner and an enduring icon of goodness. So quit being a square beg in a round hole. Quit comparing yourself with others. Quit letting people put you down and say you’re not good enough. Remember, “everyone” Albert Einstein, the man whose life is summarised as GENIUS said, “everyone is a genius.” That includes you! It further says we should exercise those gifts according to the faith that God has given us. All you need to do is ask God to help you identify what He has put in you if you don’t know it already and work with Him to develop and use it to impact the world. That is the path to success and fulfilment and I hope you begin to do it right now, Genius! I would have been a victim, but thank God am where I am today. Masscom we rock. We so rock, Flo! Cheers! Yeah! I pray that God grants wisdom to parents to affirm and support their kids according to their God-given abilities. Thank you Ma for the encouragement.Remain blessed. I think this is all about being who you are and not letting others influence you. There is nothing like one knowing what he or she is good at. Thank you ma I have learnt a lot from this great piece. thanks a lot ma.i found this write up so encouraging. o yeaa, our parents should desist from imposing a career choice for their children. I love the fish quote. We were not all put here on earth to do the same thing. We are each uniquely created by God for a specific purpose. Such an encouraging post. I was enchanted by the quote the first time I saw it too. That's why I decided to build a post around it. Thank you, Kathleen, and stay super blessed! I believe our existence on earth was for a purpose. So why then do we compare when we are gifted with different potentials? I believe we should quit comparisons and start harnessing our potentials for the glory of God.Such a thought changing post. Sometimes we do things because others do it and it's working for them forgetting that we are not those people, other times we do things because our family wants us to do so... We don't think of what our calling is or what we are good in.. We all have one thing or the other that we can do very well. Why not develop yourself in that area instead of becoming somebody else? As our faces are different, so are our talents, attitudes, abilities and so on. what works for A may not work for you, its best to inquire of the Lord, what his plan and purpose is for you. nice post ma! Woaww.. What a wonderful piece! Ma, this is 100 percent inspiring. I'm touched. Most people out there live their lives trying to be whom they're not destined to be and that is why they keep on failing. Indeed, most successful people today worked in line with their calling and that is why they keep on florishing. Life is all about knowing the key! No better day or time to have read this post. "So quit being a square beg in a round hole. Quit comparing yourself with others. Quit letting people put you down and say you’re not good enough. 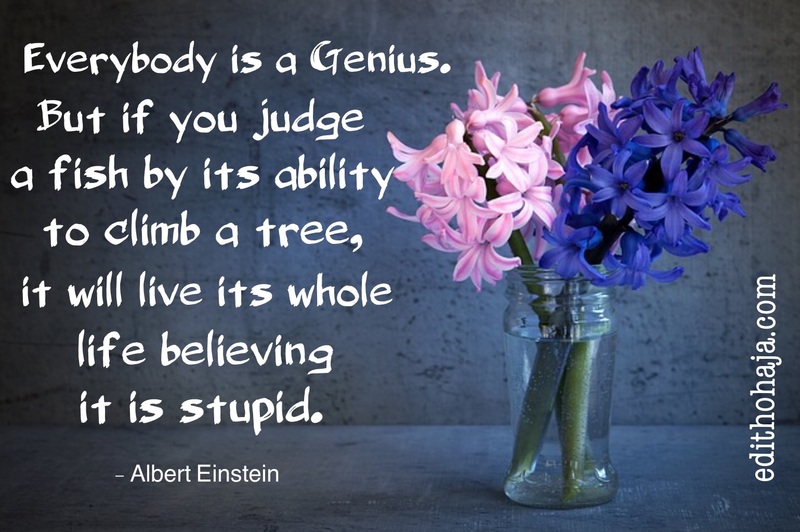 Remember, “everyone” Albert Einstein, the man whose life is summarised as GENIUS said, “everyone is a genius.” That includes you!" This really got me. Thanks Ma'am cos I believe I'm a genius just like everyone is. Thank you very much for this particular post ma for it is inspiring, motivating and captivating and i know it will help very well in the struggle of life. it doesnt really matter where you are now but the most important thing is that you keep moving. In the other hand, parents should allow their children to do what they think is best for them. Very true, Tiffany! Thank you. Albert Einstein is truly a genius and I too, I'm a genius, I must say. This is the first time I am hearing this story about Albert Einstein, he really insisted on his dreams and became someone to be remembered worldwide. I am encouraged by this post. One should just know what he or she is good at and focus on it. Thank you, ma. You are a genius too. This is a wonderful and motivational post that makes an individual to believe in himself and his ability. It shows us that we should not feel inferior to our fellow man. I have to say this is very inspiring. We all have our race to run in life, we just have to know what path is ours to take and run patiently with strength, determination and endurance to get to our goal in life. This was really pondering on my mind, every body got his or her own talents or abilities as was clarified by Albert Einstein. Parents and guardians should not dictate ones career, because everyone is blessed with an uttermost skill and talent. Really splendid and didactic. Yes, we all are beautifully and wonderfully made. We all carry something peculiar in us. Never underate yourself, there is no limit to what you can achieve. Thank you for this nugget. It really reminded me of an assignment I have to do about myself. Everyone was created with one gift or the other and therefore no one is a failure. My inability at this does not define me. Because my ability could be innovative to build another's life. This is really inspiring! There are lots of people the are depressed because they believe they are not good enough or compare theirselves to others which is the fastest way to kill the soul. Everyone has something great in them, we just have to make time and find out the gifts we have, accomplish it and still cheer others on. Everyone got his or her own talent Though, some people discipline may be more peculiar than others but we all important to the development of our community. True talk. I believe that God has bestowed upon every man a unique quality, a unique capability. People should also learn not to listen to people who judge them quickly and are fast to pointing fingers when things go wrong. Everyone has individual talents. These talents are very useful in their own way and in their own time and circumstances. Because you feel you don’t fit in at the moment doesn’t mean you don’t have a gift. Wait for your time and when it comes everyone will value your talent. Nice one Ma,an inspirational and aggressive post.We the youth should deploy every godly means to make it in life.Every being is endowed with gifts,talent we should explore it to get to the top. This post is just the best. Thank you Aunty Edit. Its God that will surely bess you! perfection is applauded and appreciated in all we do.we should seek through find or discover our God given talent and develop it to the fullest.being a square peg in a round hole brings our morale and zeal down. We should always strive to be the best.